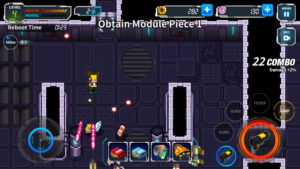 Game Info – Dodge Hard By IKINA Games Is The Ultimate Bullet Hell Role Playing Game For Android. You Are A Hero Who Fights Against Robots To Save The World. Game Starts With A Story And A Quick Tutorial. You Enter Into Underground City And Face Waves Of Enemies. You Can Jump To Dodge And Protect Yourself From Enemies’ Bullets. Shoot Them By Gun For Light Attack, And Use Fever Mode To Explode. Controls Of This Game Are Easy To Use. Simply Touch And Hold The Controller And Navigate Your Player – Right, Left. Another Side Is Of Jump, Guns, And Shoot Controls. 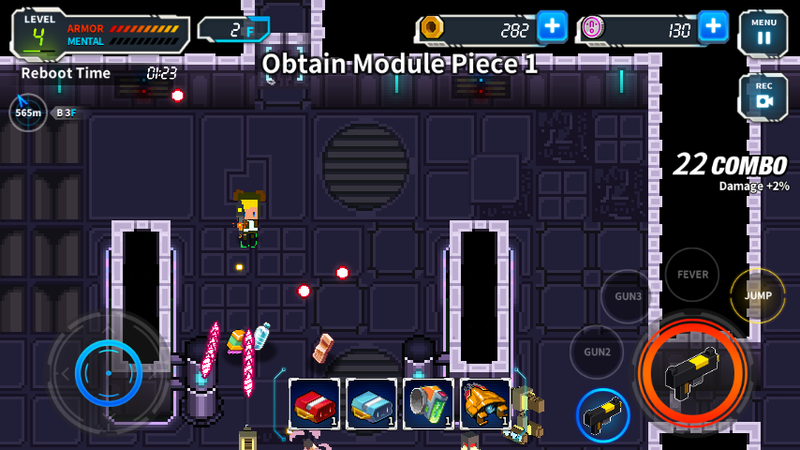 There 3 Guns Slots. So, You Can Switch To Other Guns Anytime. Each Gun Fires Different Types Of Bullets. When You Kill Your Enemies, You Have To Collect Items i.e. SSC IC, Base Class Power, Reactor, Steel Piece Etc. Use These Items To Craft New Guns Or Weapons. You Will Face Various Types Of Enemies Who Have Special Guns. Simply Navigate To That Direction Where Your Enemies Are, Tap On Shoot Button. Your Character Will Automatically Target Enemies. After Every 5th Floor Of Underground City, Battle With Boss. Each Boss Has Different Bullet Patterns. Level Up, Collect Items, Craft, And Enhance Your Gameplay. There Are Lots Of Guns To Craft. You Can Buy More Items With Real Money Also. Graphics – Retro-Style, Controls – Easy To Use, Size – 73 MB(Approx. ), Download: Here(Google Play Store). Price – Free(Contains Ads, In-App Purchase).